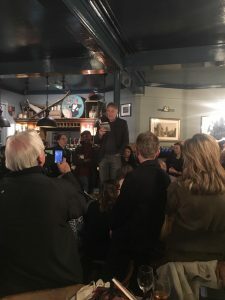 There were fireworks in Norwich city centre last Friday evening when the Ballad was given its Norfolk launch at The Book Hive. The fireworks weren’t actually in The Book Hive, but exploding in the night sky overhead for the entertainment of anyone who hadn’t seen fit to come and listen to Henry Layte and me chat about all things Syd and Morgan in front of one of the most engaged and appreciative audiences I’ve ever experienced. I offer my heartfelt thanks to everyone who was involved in putting on the event and to everyone who attended. This little throng included two absolute suckers for punishment – neighbours of mine to the south of the Cotswolds here – who had also been whooping it up at the absolute belter of a party a week before in Oxford on publication day itself. The image below, taken at that earlier event, makes it look as if I have been tied to the stake and forced to give a reading, but in fact I did it relatively voluntarily – though I drew the line at trying to ‘do’ Syd and Morgan’s voices in the extract I selected from their 1968 conversation. A very civil Darcey Bussell was in the green room with me beforehand, but just as I don’t ‘do’ voices in public places, nor am I prepared to dance with a stranger, even on the radio. I’ll try to offer some more measured thoughts on the book’s reception once this rather wonderful burst of launch publicity has run its course. (There’s another event in Dalston, London, this Thursday [8 Nov] to which all are invited free of charge, and I’ll post information about that separately.) At this point I’d just like to thank everyone who has been involved in any way, and especially – once again – Henry, whose labours on behalf of this book continue to be a wonder to behold.